On Dec. 16, Mayor Bill Peduto was part of an hour-long, nationally live-streamed discussion on the topic of affordable housing with the Department of Housing and Urban Development in Washington, D.C. During the talk, Peduto detailed the Penn Plaza crisis in East Liberty and the resulting agreement, a deal that included a new special affordable-housing fund. The agreement created a district surrounding the East Liberty Transit Center, inside of which publicly owned or financed properties must contribute a portion of any tax abatements they receive to a fund for affordable-housing projects within the district. However, what wasn’t shared with the country, or even with advocates within the city, was how city officials recently left on the table $1 million that could have gone into that fund. 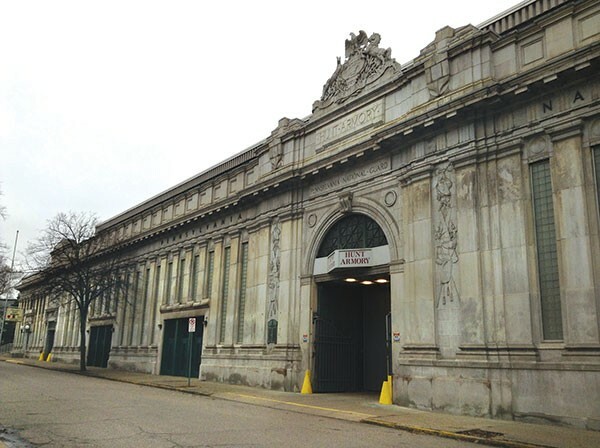 One week before the mayor’s D.C. discussion, the Urban Redevelopment Authority awarded the Hunt Armory site, in Shadyside, to Kratsa Properties, a developer that plans to turn the historic military facility into an indoor ice-rink complex. And while this project has broad community support, especially in Shadyside, selling to the ice-rink developer meant a significant loss to the special affordable-housing fund — a fact that was barely, if ever, debated throughout the public process. Three different proposals for the armory were considered by the URA. If built, the ice rink would generate $600,000 for the fund, while an office space/business incubator would have generated $1.4 million, and a high-end apartment complex would have created $1.7 million, according to a URA presentation. But other than a single slide detailing these varying amounts, not one person of the dozens present at the Dec. 10 URA meeting discussed the potential loss to the affordable-housing fund. Furthermore, it appears that affordable housing wasn’t discussed during the community meeting process either. Alethea Sims, president of the Coalition of Organized Residents of East Liberty, attended one of the community meetings at Calvary Church, in Shadyside. She says affordable housing wasn’t discussed during that meeting, nor was the effect the project selection would have on the fund. “We can say we are doing things toward affordable housing, but talk is cheap. I want to see some actions,” says Sims. Pittsburgh city councilor Dan Gilman, who represents Shadyside, put on community meetings where hundreds attended to discuss the plans for Hunt Armory. He said in an email to City Paper the financial “impact on the affordable housing trust fund was something [he] thought about and discussed with people” and was an important factor that was weighed with other factors, such as community input, historic preservation and traffic. Pittsburgh City Councilor Daniel Lavelle, who sits on the URA board and the city’s Affordable Housing Task Force, says he voted in favor of the ice rink because of strong community support. He added that the difference in the amount generated for the affordable-housing fund is just “a drop in a bucket” in relation to the large amount of permanently affordable units the city needs. But $1 million might go further than many think. According to Linda Metropulos of Action Housing, a nonprofit developer specializing in affordable housing projects, the URA typically uses funds, not to fully fund construction of low-income units, but to incentivize outside developers to construct them. For example, this summer, 40 permanently affordable units were completed in Larimer costing $13 million. According to the Pittsburgh Post-Gazette, the URA procured $1 million in federal money to help fill a gap in funding for that project. And Metropulos says funds that size could be used even more efficiently to address the affordable-housing problem. Penn Plaza resident Randall Taylor, who was part of negotiations regarding the fate of the apartments, says he wasn’t surprised to learn that the potential for lost funding wasn’t more fully discussed in public — or that the building wasn’t considered for affordable housing. Acklin says no armory proposal included affordable housing plans (however the armory’s proposal request doesn’t mention affordable housing as a suggestion). Also, had the high-end apartments been chosen, the developer might have been required by the Penn Plaza agreement to use “reasonable efforts” to include a portion of affordable housing. Acklin says the URA opted to support the ice rink because it still contributes to the affordable housing fund and addresses the public space vision of the area. Editor’s note: Story has been updated to include information from Pittsburgh City Councilor Dan Gilman.